For immediate service, please contact us at 508.734.5884. 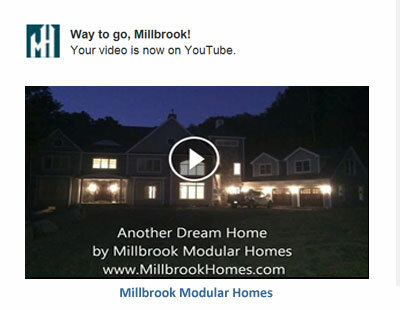 Millbrook Homes offers dozens of modular plans to choose from in MA, RI, CT and NH states. 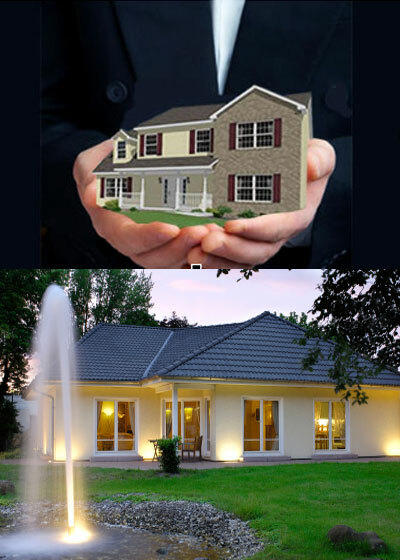 Customize them or give us your plans and we will give you the keys to your dream home in 6 weeks. 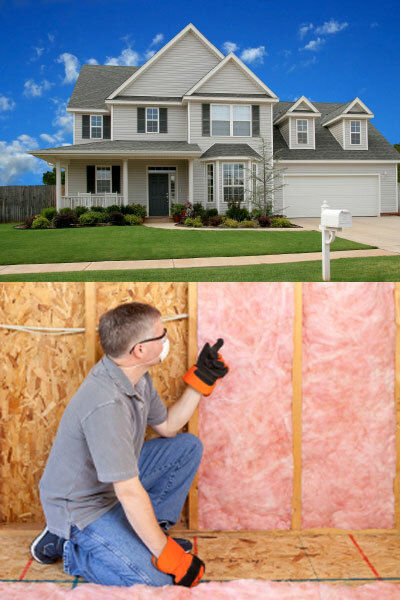 Home of the 2″ x 10″ exterior walls that can save you up to 30% in heating costs. 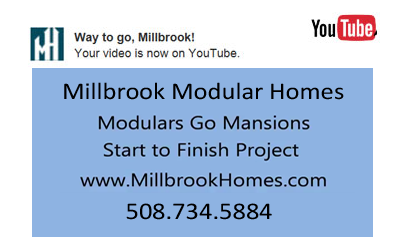 Millbrook Homes specializes in constructing factory precision, energy-efficient, custom homes in MA, RI, NH, and CT. Our experienced team works with you from start to finish on all the decisions and details involved in creating your customized modular home. Our factory precision modular homes are manufactured with superior materials by trained craftsmen in a controlled environment where every stage of production is carefully monitored and taken through a meticulous quality control process – an approach which produces an energy-efficient home built on time and on budget. 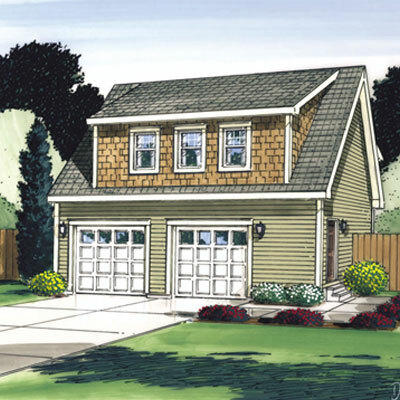 Once your material and color selections are completed, your new precision factory-built home will be delivered to your site in 6 weeks. 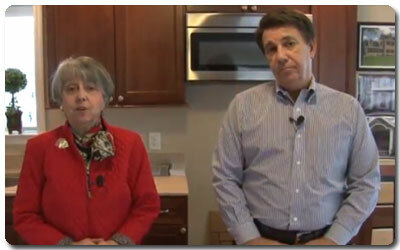 We are a full service turn-key company serving MA, RI, NH, and CT. 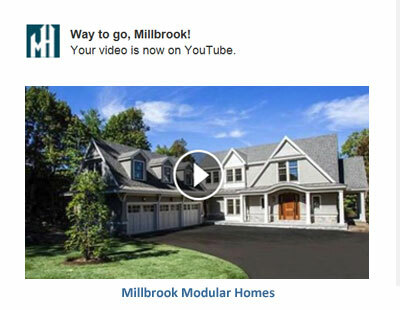 This means that site excavation, engineering, foundation, plumbing, electrical hookups, driveway, landscaping, walkway, outdoor lights and even your mailbox can be completed by Millbrook. 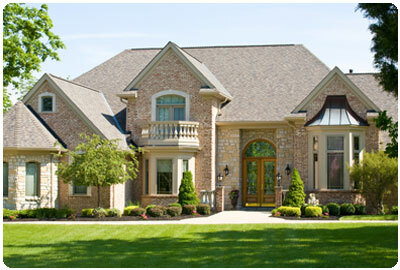 You may do some or all of the site work; or you may have us take care of every detail. 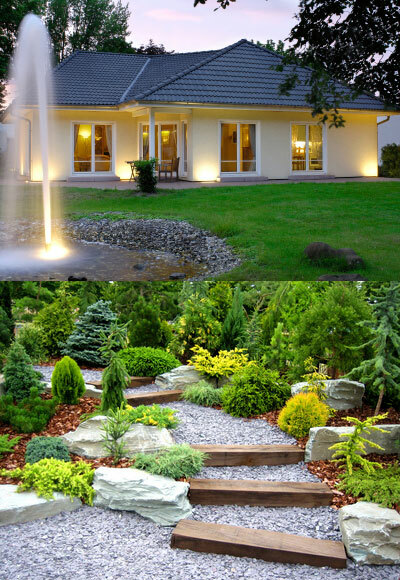 We also offer land location and financing services. Further details are available on our SERVICES & OPTIONS page. 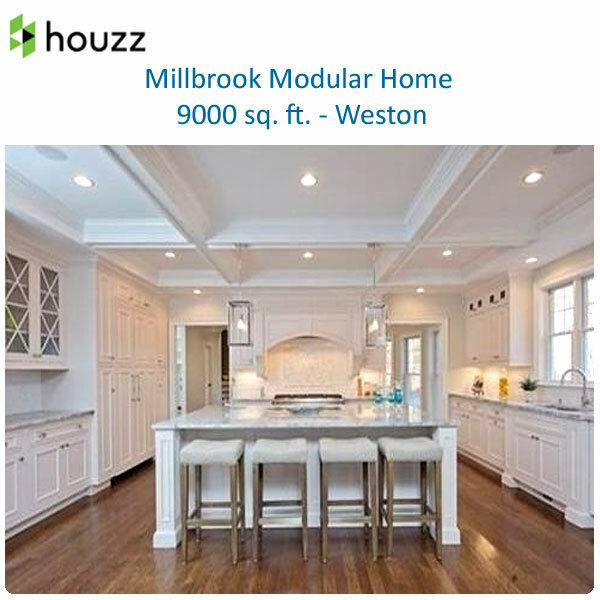 Millbrook Homes – providing services in RI, MA, NH, and CT – creates single, multi-family, and additions to existing homes for clients ranging from homeowners to large tract developers from gracious colonial estate-style country homes to multi-family mid-rise urban projects. 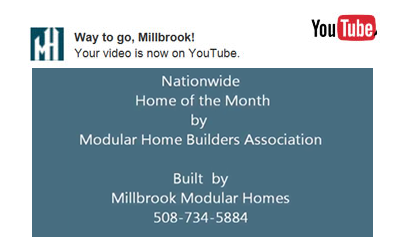 Millbrook Homes is a modular home builder that works with you to custom build the home you want. We offer the most complete range of services and the widest selection of options. 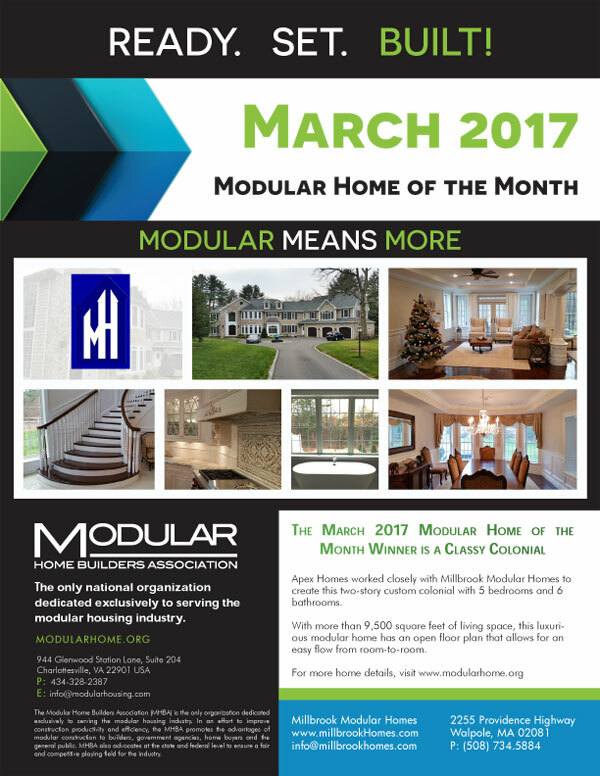 Factory manufactured homes are stronger, more durable and have increased energy efficiency compared to traditional stick-built homes. 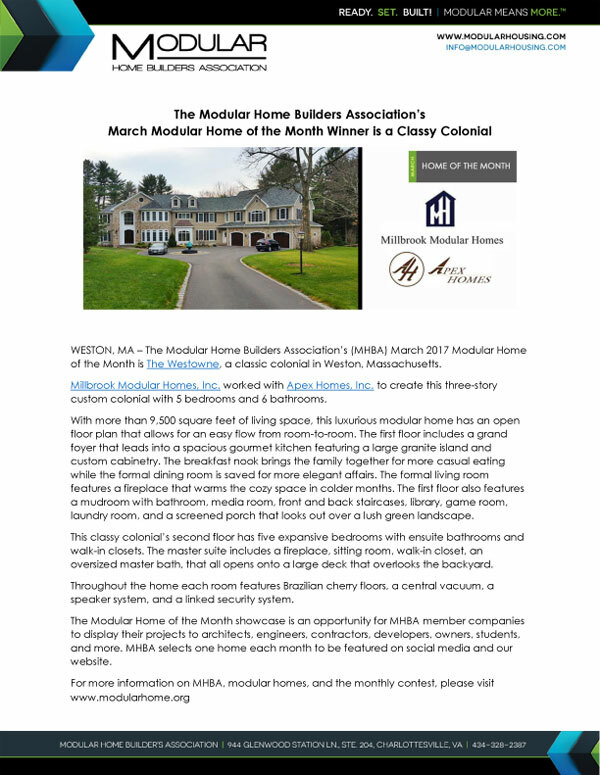 Although factory manufactured homes cost about 25% less to build than traditional stick-built homes, 25% more lumber is used in the construction of prefabricated modular homes. 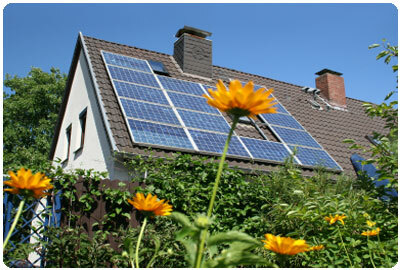 It’s the future of home building; a tighter, more energy-efficient home. 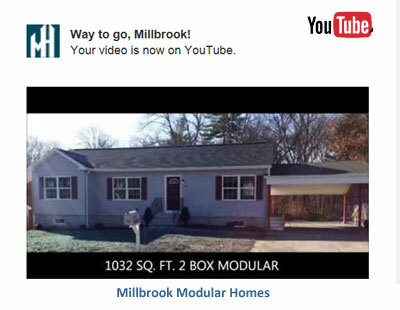 Millbrook Homes is proud to produce modular homes that are energy efficient, ENERGY STAR qualified and environmentally friendly. 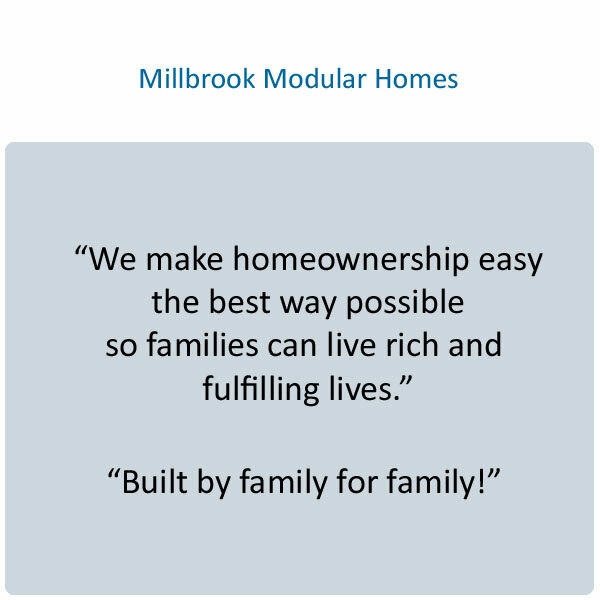 It is our goal at Millbrook Homes to provide our customers with the most efficient modular home for the best price possible. 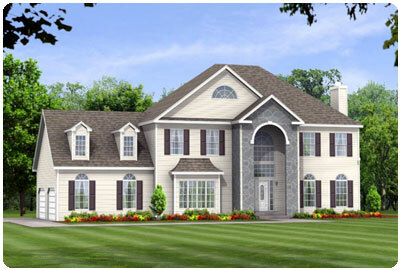 Please visit our DESIGNER HOMES for plans and styles section or download our brochures. Please visit our MODULAR GARAGES for plans and styles section or download our brochures. Financing is available; approvals and money in your hand in six weeks for qualified applicants. 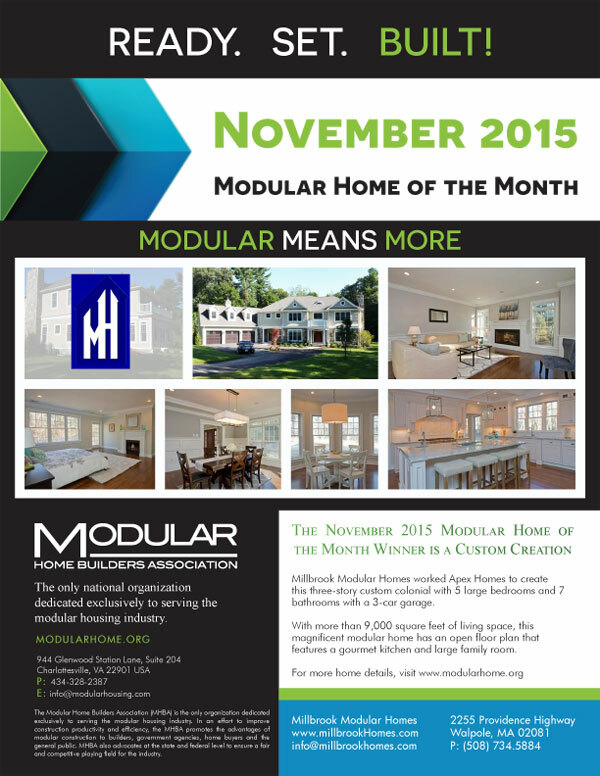 Come See Our New Model on Route 1 in Walpole! 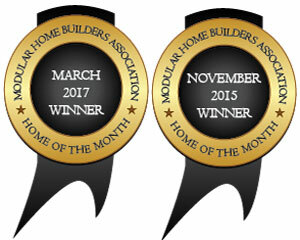 We have three Showrooms Showing over 200 House Plans. (1.3 miles north of Gillette Stadium on the southbound side). Open Tuesdays – Friday 2:00 P.M.-6:00 P.M.
Saturdays 10:00 A.M. – 3:00 P.M.
(2 miles north of Gillette Stadium on the southbound side). 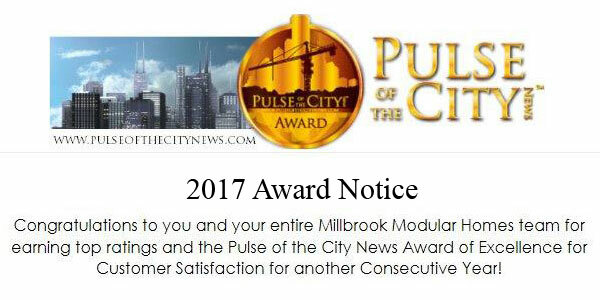 At our informative seminar we will discuss the process of “factory precision” building modular homes from Millbrook Homes. 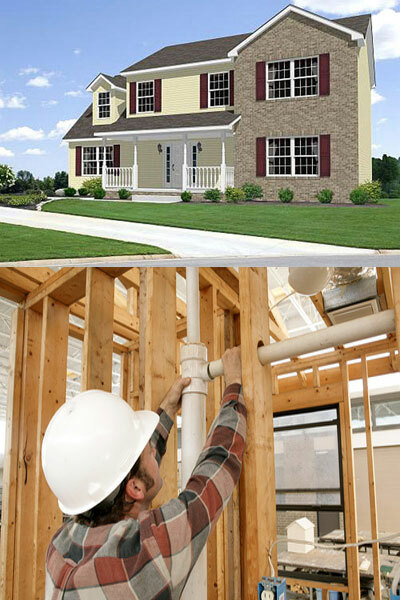 You will be provided with all the information you need to begin the journey of building and customizing a new home that fits your lifestyle and budget. 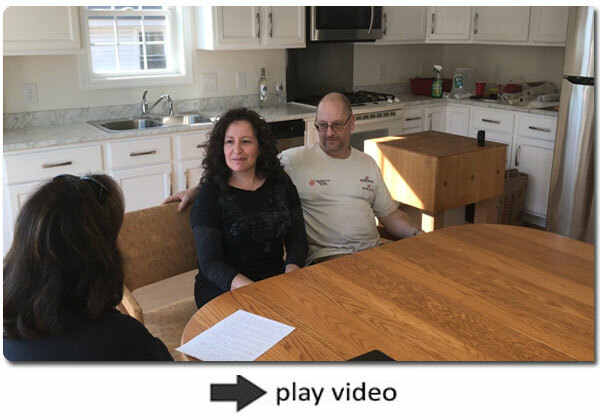 Site selection, permitting, approvals, customizing, “setting” and finishing your new home in place will be discussed in detail so that you can make the most informed decisions for your family. 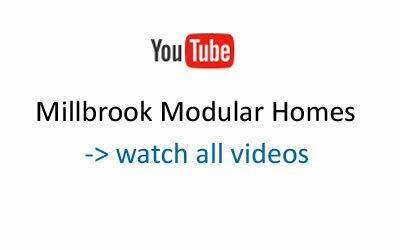 Whether you are just learning about modulars, or if you have selected your site and are ready to go — this seminar provides you an opportunity to ask questions, view a video of a home being “set” in place and and touring our 3 bedroom, 2 story model to give you all the knowledge you need to go modular! 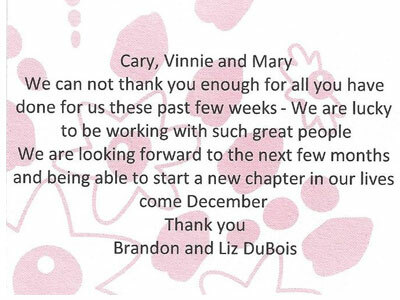 Tony and I would like to let you know how much we appreciate everything you have done for us in our decision to add an 800 square foot in-law apartment to our daughter’s house. This was a very slow decision-making process for us. We did not have any conceptof how living in a module home would be. You were so patient in walking us through each and every step. You never made us feel like we were wasting your time (even when we were not 100% sure that we would be happy going this route). The approval time from our town was a bit slow; however, you kept us abreast of each discussion you had with them so we always knew what the updated status was. From clearing the land, digging the foundation, preparing for delivery of our in-law apartment, to the actual setting of our home, each and every one of your employees were professional and very respectful of our feelings and answered eachand every question we had without ever making us feel that it was not important. Your follow-up visits to make sure we were 100% satisfied with the final product went above and beyond what we expected from you. 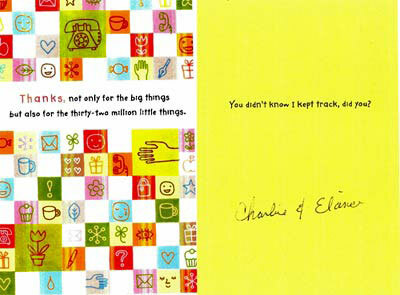 It has been a pleasure working with you and your employees. 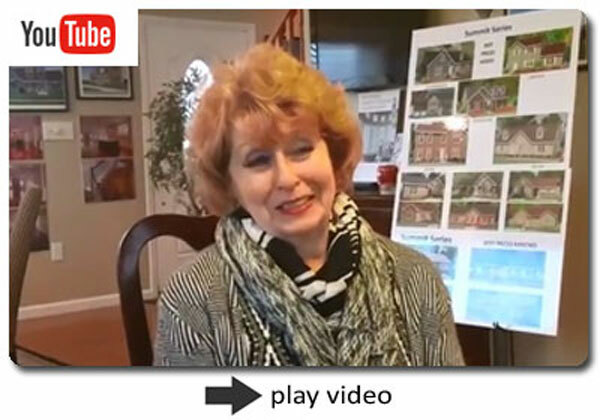 Please share this testimonial with any of your clients that are considering using your firm. Subject: Powder Room Cabinet – Sharon House Good Morning Good Men!! 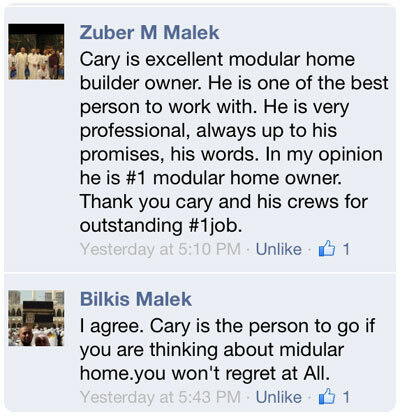 Cary, I hope that you are in good spirits this morning. It has been a real pleasure to watch the boxes become our home… I am really psyched by all of the progress. Your crews have been amazing and they have truly been a joy. I have been shouting your praises from the rooftops all over town! Dragan and I treated your Maine crew to a Burger and Beer after they shut down on Wednesday night. They were so very appreciative. It was simply a small Thank You for all the work they are putting in. The house is something wonderful!! !